Today is a big day for all you Harry Potter fans! It’s his birthday! 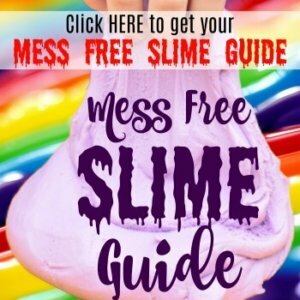 Are you excited about the new “book” coming out today? We are HUGE Harry Potter fans in this house. When my husband and I were dating, we did Harry Potter cosplay as Tonks and Lupin. I had purple and pink hair, and he handed out chocolates. We even won costume contests! It was a lot of fun. Now that the new movie is coming later this year, you can bet we’ll be at it again. 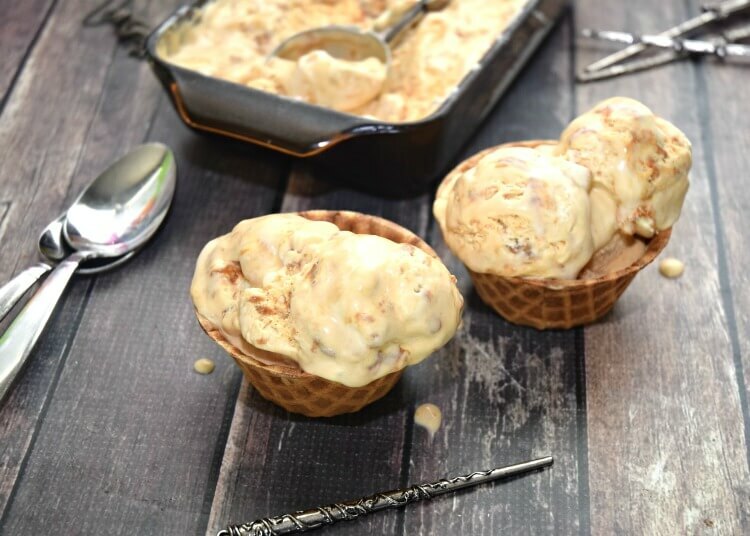 To celebrate let’s have some ice cream — some Butter Beer Ice Cream! This is an easy recipe, and the best part is…it’s no churn style! It’s buttery with a touch of caramel. You and the kids will love a big ol’ bowl while you have a Harry Potter movie watching party. Or maybe you’re like me and just want to snuggle on the couch with a Harry Potter book and a bowl for yourself? 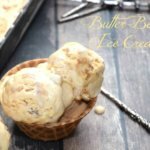 I started out with butterscotch ice cream topping, cream soda, brown sugar, and butter! 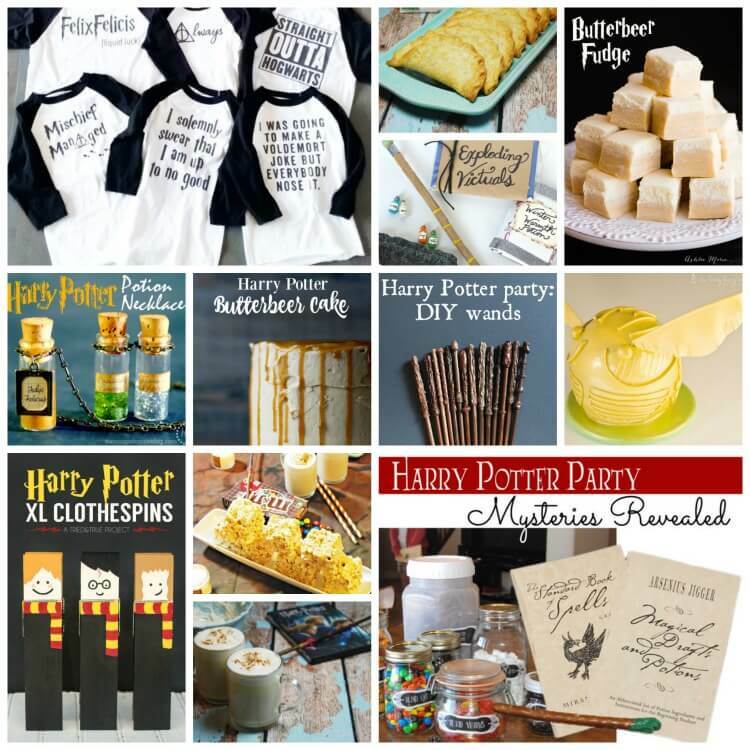 You can’t have Butter Beer without butter. I combine all the ingredients and boil them down til they are thickened into a syrup. It took me about 10 minutes to get there. While it’s cooking, the butter turns into that nutty delicious brown butter that just adds to the flavor. Then, I freeze it for about 30 minutes. When it’s almost been 30 minutes, I whip up the ice cream base, which is whipping cream, sweetened condensed milk, a bit of brown sugar, and some dulce de leche (caramel). It turns the ice cream into a light golden brown. Then, I remove it from the electric mixer, and add big dollops of the dulce de leche and hand mix them. This way when it freezes, there is streaks of dulce de leche in the ice cream. When the butter beer syrup is cooled and the edges are turning a bit thick, I add spoonfuls on top of the ice cream base. Then, I swirl them in gently so they won’t be completely mixed in. Let the ice cream freeze overnight. 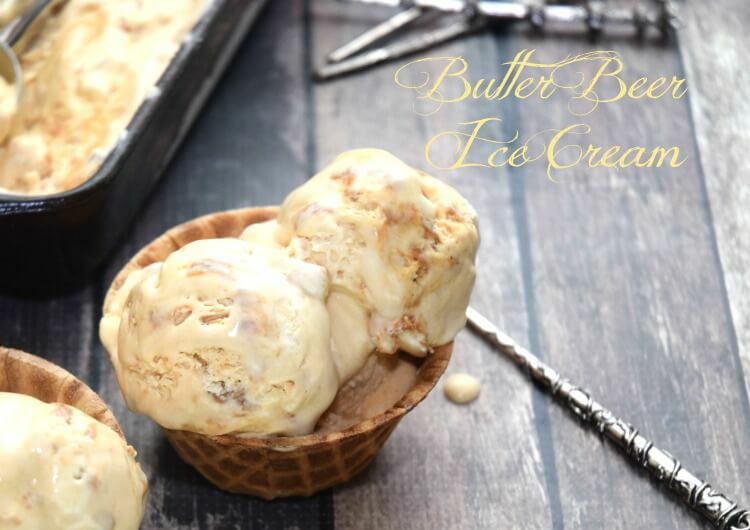 The next day, you’ll have buttery ice cream bliss that will remind you of a hot cup of butter beer. Combine cream soda, brown sugar, and butterscotch syrup in a saucepan on medium high heat. Once it reaches a boil, add the butter. Stir occasionally and keep watch in case it tries to boil over. Boil for about 10 minutes until the syrup is thickened. Pour into a freezer safe bowl and let it cool in the freezer for about 30 minutes. The edges will begin to solidify when it’s ready. Combine the whipping cream, brown sugar, and sweetened condensed milk in an electric mixer and beat on high just until hard peaks form. Add a large dollop of dulce de leche (about 1/4 cup) to the ice cream base and beat for just a few seconds until it’s mostly mixed in. Remove from the electric mixer and add dollops from the can of the dulce de leche until it’s all been added. Gently mix the dulce de leche into the ice cream base with a spatula, so that large streaks are left unmixed. Pour the ice cream base into a freezer safe container. 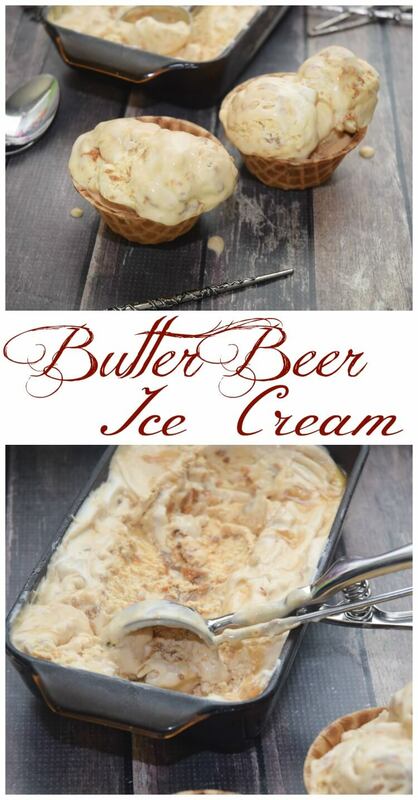 Add spoonfuls of the butter beer syrup over the top of the ice cream. 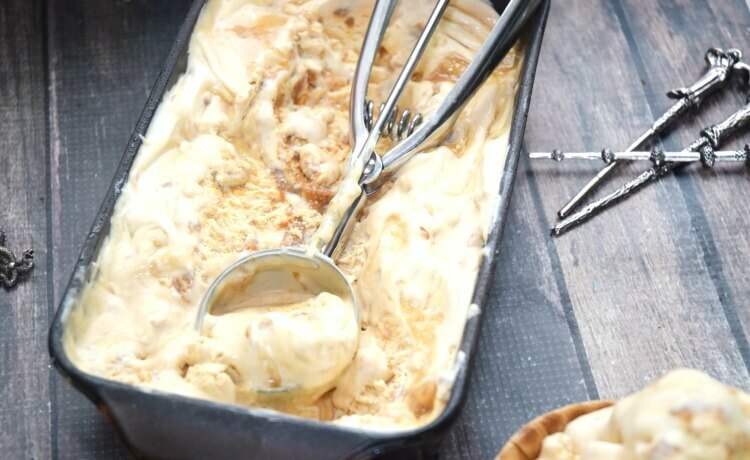 Gently swirl the syrup into the ice cream with a knife or spoon so that it doesn’t completely mix in. Serve when it has sufficiently frozen. What is your favorite Harry Potter book or movie? How big of a pan do you need to put this in? I use a loaf pan.